"I don't know who you think I am, and I don't care. Leave me alone!" 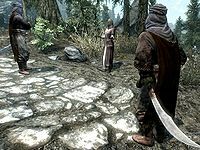 A Redguard Woman may be encountered on the roads being questioned by two Alik'r Warriors. She is a Redguard farmer and can only be encountered once the Alik'r Warriors show up in Whiterun as part of the quest In My Time Of Need. When the quest is completed, it is no longer possible to meet the woman. She wears a randomly determined set of farm clothes (8 variations), boots (4 variations), and has a 50% chance of wearing a hat (3 variations). She only carries a small amount of gold. 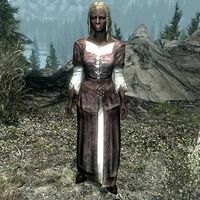 After the conversation, it is possible to approach the annoyed woman and she will not hesitate to provide her honest opinion on the Alik'r: "Foreigners. What a nuisance!" If you ask her what the negotiation was about she will respond: "They thought I was some other Redguard woman! They just wouldn't leave me alone. I hope they get lost in the wilderness."